Purchasing a new gazebo for your backyard or lake property requires a little planning. What are you going to be using your gazebo for? Entertaining? A shady place to rest & read? Whatever you’re intended use is, you’ll find the below gazebo tips and ideas helpful, and if you’re still left with questions, contact us for information on your specific situation. Just like with cabins or sheds, to a large degree, how you’re planning on using your gazebo determines location choice. Is it a stylish garden gazebo or a gathering place for friends and family on beautiful summer afternoons? Perhaps you want an enclosed gazebo to install a hot tub or spa. Aesthetics are also equally important; you may choose to highlight your gazebo by making it the center of attention or build it into the existing surroundings, a quiet place to relax and reflect. Existing structures and lot size will also impact the final site choice. Depending on the size of your property, you may want the gazebo to be close to the house, or have it set back as a destination point on the property when taking a leisurely stroll. Property location – is the gazebo going to be located at the lake, or is it in the city? Privacy concerns in the city may influence where you decide to build, while making sure appropriate scenic views are available at the cottage. Don’t forget about checking on permits for your prefab gazebo build, or you my get an expensive reminder. If the gazebo is under 100 sq. ft. you may not require a permit. Proximity to the water may also be a factor. Townships and rural areas often have restrictions on property line setbacks and how close to the water you can build, be sure to check with them before you start building anything. Aesthetics – the most important consideration when it comes to gazebo kits due to their non-utilitarian usage. Since gazebos are often used as a focal point for gardens and patios, a great idea is to highlight your structure by making it the center of attention. Much depends on what your design goals are. If you’re not sure what style to go with, have a chat with one of our designers, we’re here to help. Our range of custom gazebo styles and sizes are vast, so it should be easy to find the perfect fit. Be sure to spend sufficient time browsing our gazebo photo galleries and choose a style that best reflects your personal taste. You can also mix and match our gazebo styles to create your own. If you like the roof of one style, but prefer the railings of another, no problem! Simply visit our gazebos section, select style, then mix n’ match, and play around mixing the styles together. It’s smart to think about how you may want to cultivate the landscape in your gazebo’s immediate surroundings. Shrubs, flowers, and other garden details provide a nice complement to your gazebo design and will help to define the space. Many people also choose to lay flagstone or other pavers to create a unique pathway to the gazebo opening. A little garden decor provides nice finishing touches to a tranquil space. Strategically placed, things like trellises, pergolas, lights, wind chimes, birdhouses – and even your favorite piece of weathered furniture can go along way to creating the perfect setting for your gazebo. Be sure to check out our resources page for links to recommended landscaping professionals. Finding the perfect size can be a little tricky, as you don’t want something that’s too small, but you don’t want to go overboard and get something that’s too large for the area it’s going. Our general rule of thumb is that an 8′ gazebo fits 2 people (2 chairs and a small table). With every two-foot addition, two more people can be seated comfortably in the gazebo (for example, a 10′ gazebo holds 4 people comfortably, and a 12′ gazebo holds 6 people comfortably, etc.). As with all our other buildings and size options, we’d recommend that you get some stakes and string and physically stake out the size you’re considering. This will give you a real world look at how the size you’re considering will work in your space. As always, contact us at any point in the planning process and we will provide you with as much help as you require. Cedar, cedar and more cedar. 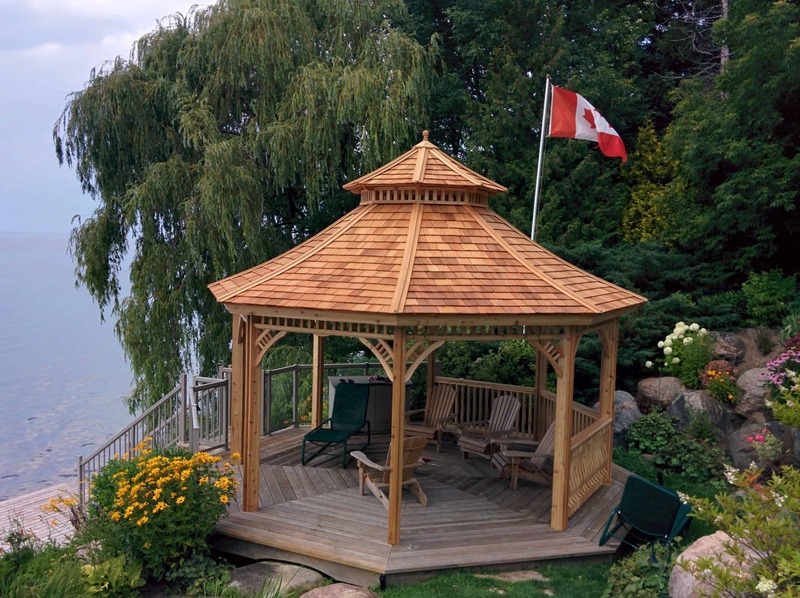 All of our gazebos are constructed from a premium grade of Canadian western red cedar. We use the finest materials on the market, and every piece is hand inspected for quality, so be assured that what you get is truly top of the line – we don’t mess around. All our fasteners are either zinc plated or galvanized to eliminate any possibility of rusting. If you’re looking at an enclosed model, as with all our options, quality hardware and materials are used for all windows and doors – to ensure a water tight structure for years to come. Have a look at our gazebo materials section for more on what you can expect with your Summerwood gazebo. We provide cedar shingles with our gazebos which are absolutely beautiful. They are durable, life-long and they will outlast all style trends. That said, you can choose to omit the cedar shingles and use asphalt or tile depending on what look you are trying to achieve. Have a look at our roofing options. Copper styled roofing is stunning on our gazebos if your budget allows for it. Our gazebos go up very easily. Most of our customers tackle the project themselves and quite enjoy it; especially our prefabricated formats. The roof, walls, and floor sections are prebuilt; all you need to do is put it all together. Read more detailed information on assembly and the tools required to build your gazebo. If you’d prefer to leave the building to the professionals we can help here too. We have a local installation service, as well as a vast list of contractors with experience building our products. Just give us a call and we’ll help you sort it out. Have a good look through the below styles, as it really comes down to which gazebo styles you prefer. Sizes range from 8ft. to almost as large as you want. We also suggest that you peruse our gazebo photo gallery for ideas. San Cristobal Gazebos – Our San Cristobal Garden House is a classic beauty designed for year-round use. This exquisite structure is fully enclosed and comes with French doors and beautiful opening windows (complete with screens). If natural light and an enclosed area is a priority, the San Cristobal is a wise choice. This style is ideally suited as an office, gazebo or even a breakfast room. Bali Tea House Gazebos- Inspired by traditional Japanese architecture, our Teahouse style gazebo is brilliant in its minimalism. Perfect as a hot tub gazebo or just as a place to relax on a hot summer afternoon, the Bali Tea House gazebo is sure to leave you feeling refreshed. Monterey Gazebos – The Monterey is our classic gazebo featuring clean, smooth lines. This gazebo will compliment the architectural details of your home and the landscape of your garden beautifully. Victorian Gazebos – Our Victorian gazebo adds elegance to any landscape. Its two-tiered pagoda roof style, along with its attractive spandrels, decorative arched brackets and hand cut railings offer a unique and historical design element. Carlisle Gazebos – The Carlisle is our fairytale gazebo. It boasts charming gingerbread spandrels, spindle railings and a one-tiered roof. Its unique design makes for a splendid focal point. Tattle Creek Gazebos – The newest design in our gazebo line up is the Tattle Creek. Defying convention, this gazebo features a smooth spandrel, wide railings and a high roof. It is truly in a class of its own. Montpellier Gazebos – The Montpellier garden house style gazebo is a 4-sided (square base) design. Like a traditional gazebo, it has railings and spandrels. This style is well suited in a rustic garden, pool side, or in a commercial setting. Coventry Gazebos - This gazebo features stunning leaded glass French doors and tilted opening windows, a high cedar shingled roof, elegantly cambered eaves, traditional brass hardware, and exquisite trim and detail all around. It is perfect is any setting, especially in the backyard, used as a place for relaxation.